In my previous post, I described how the ancient Greek Eratosthenes measured the size of the Earth. Today I'd like to talk about how you can calculate the mass of the Earth. Henry Cavendish (1731-1810) was a British scientist who made several important contributions to chemistry and physics. He was born into an aristocratic family and his family wealth and frugality allowed him the freedom to devote himself to his academic interests. Cavendish was also notoriously eccentric. He reportedly spoke in a "shrill, high-pitched" voice and hated talking to people. He left notes to communicate with his servants and built a special staircase in his home for them so that he wouldn't have to see or speak with them. If someone did manage to corner him for a chat, Cavendish would reportedly issue a "peeved squeak" and scurry off to escape the social encounter. His anthropophobia (fear of people) was particularly acute with women - he apparently never had a relationship or married. Neurologist Oliver Sacks has suggested that Cavendish suffered from Asperger Syndrome. Cavendish was also noted for his odd manner of dress. He was known for always wearing a faded violet coat and three-cornered hat. Clothes that had been out of fashion since his grandfather's time. When one pair wore out, he simply commissioned someone to make another set. The only place Cavendish ever interacted with people outside of his home was when he regularly attended the weekly dinners and meetings of the Royal Society. There, he lost his inhibitions when discussing his scientific work and was highly respected by his peers despite his eccentricity. Cavendish is perhaps best known for the eponymous Cavendish experiment which he published in 1798. He started by constructing a torsion balance which consisted of two separate suspension systems. One held two 12-inch lead balls that weighed almost 350 pounds each. 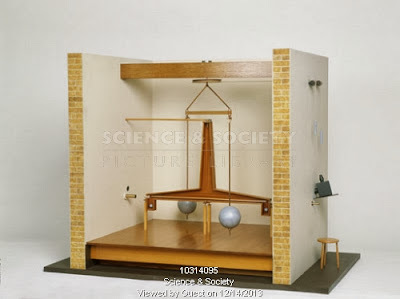 The other system held two smaller 2-inch lead balls (weighing about a pound and a half each) attached to the ends of a six foot wooden rod which could rotate freely. The two smaller lead balls were located about 9 inches away from the much larger weights. As these masses attracted each other (by the force of gravity), the wire suspension system would twist (hence the name torsion balance). Cavendish built the balance in an outbuilding on his property and meticulously measured the deflection of the masses and calculated a value for G - the gravitational constant. 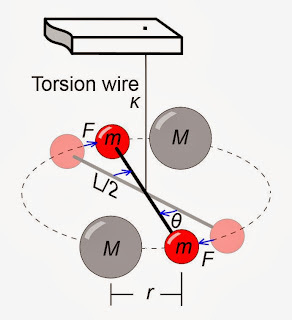 Where L is the length of the rod holding the two smaller masses, M is the mass of the large balls, r is the distance between the large and small balls, q is the angle of deflection, and T is the resonant oscillation period (time units) of the balance (basically a measure of how easily the wire twists and related to k, the torsion coefficient of the wire). Cavendish obtained a value for G of 6.74 × 10−11 m3 kg−1 s−2. This value is only about 1% off from the value we use today. If you're interested in the mathematics, the Wikipedia article on the Cavendish experiment has the derivation. Where MEarth is the mass of the Earth, REarth is the radius of the Earth (obtained from Eratosthenes), g is the acceleration of gravity (9.8 m/s2), and G is the gravitational constant. From this experiment, Henry Cavendish was able to "weigh the world." Amazing! Now that we know the size of the Earth from Eratosthenes, and the mass of the Earth from Cavendish, we can calculate the Earth's density and that tells us something interesting about the unseen interior of our planet that I'll discuss in my next post.